↑ "id." Encyclopædia Britannica. Encyclopædia Britannica 2009 Deluxe Edition. ↑ "ego." Encyclopædia Britannica. Encyclopædia Britannica 2009 Deluxe Edition. ↑ Laplanche, Jean; Pontalis, Jean-Bertrand (1973). "Ego (pp. 130-43)". ↑ Laplanche, Jean; Pontalis, Jean-Bertrand (1973). "Super-Ego (pp. 435–8)". 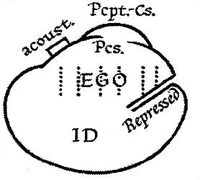 Freud, Sigmund (1920), Beyond the Pleasure Principle. Freud, Sigmund (1923), Das Ich und das Es, Internationaler Psycho-analytischer Verlag, Leipzig, Vienna, and Zurich. English translation, The Ego and the Id, Joan Riviere (trans. ), Hogarth Press and Institute of Psycho-analysis, London, UK, 1927. Revised for The Standard Edition of the Complete Psychological Works of Sigmund Freud, James Strachey (ed. ), W.W. Norton and Company, New York City, NY, 1961. Gay, Peter (ed., 1989), The Freud Reader. W.W. Norton. Section 5: Freud's Structural and Topographical Model, Chapter 3: Personality Development Psychology 101.